I find the following items handy when traveling. 1. In part because we don't live especially close to family, the Van Horns travel quite a bit. One of the things this has caused me to notice over the years is how many poorly-designed bathrooms there are out there. After wondering Is this the first time the builder ever attempted a bathroom? one time too many -- because I had nowhere to put my shampoo or soap that didn't involve picking it up from the tub or floor mid-shower -- I decided to do something about it. That something was to buy a shower caddy bag somewhat like this one that I could just throw into a suitcase and use on the other end as needed. It's on my evolving packing list and I just hang it on the piping for the shower head. 2. 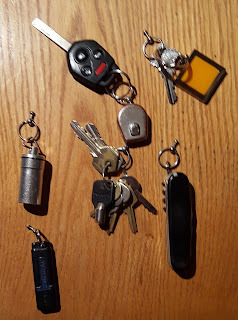 I have many more keys than I want to always carry around, and there are things I sometimes want with me that can fit onto a keychain. I can't find my particular key organizer (pictured) for sale any more, but this one is very similar. On one recent road trip, I needed everything here but the pocket knife. (I already keep a similar one in my car's glove box.) It was all on there while I drove, but the house keys and pen drive went to the hotel room safe most of the time. When I'm not traveling, it's nice to be able to separate the house key on those many occasions when everyone is already in the car and someone remembers leaving something in the house. I can leave the engine (and AC!) running for Mrs. Van Horn and the kids while I dash inside. 3. For solo trips or running errands, I often like to listen to podcasts. Unfortunately, I gather these from different providers and dislike the interfaces for most of these, anyway. Enter pCloud, with 10 GB of cloud storage. This freemium service is like adding that amount of storage to any device and is multi-platform. I can gather and organize what I want to listen to on a computer with a real keyboard and then very easily listen to what I want when I want, all with a uniform interface. A nice bonus is that it is stupid simple to transfer photos with it. 4. For picnics and trips to the beach, I appreciate being able to leave my usual watch behind and, of course, open beer. Both are a snap with a bottle-opening watch, similar to this one, that my father-in-law gave me years ago. Its battery recently died, so I effected the temporary repair of setting it to 5:01.